I picked up a 87 Blazer 2wd has 350/700r4 308 gears. I would like to out a posi traction unit in it but don't want to spend a lot because down the road I will probably but a better housing in the truck. I'm told it should have a 7.5 rear end in it. What options is there ? I came across a used unit out of a newer 90's Camaro with very low use are these the same ? do you have any idea which it is? No I don't know and I don't have the Blazer here yet ? If it has the 87 rear it is a 7.5" 26 spline. The easiest and cheapest thing is to find a later 7.6 with factory gov-lock or keep looking until you find an 8.5". Don't waste money on the 7.5" 26 spline. So the 7.6 is a direct bolt in? What uses this rear end ? Any 2wd pickup or blazer, 28 spline was 89 up though there will be varying gear ratios. The code should be in the glove box G80 is the gov-lock. I think we have a sticky with gear ratio codes. Get the whole rear end, I believe 98 up are disc. Thanks for the help I will have to check into finding one. Actually, I wasn't aware the pickups didn't get them, I've only had first gens until I bought a 2003 crew cab. No problem though the 2wd blazer rear end will bolt in, got one in my first gen.
Ok so I decided after no luck on finding a 3:73 S10 posi I went with the 8.8 Ford so today I went a picked up a 8.8 out of a 91 explorer and was told it's a 3:73 ratio. This is the ring gear picture does anyone know how to decode this? It should have a tag on the rear with all of the pertinent info. If not...count the teeth and do the math. take the ring gear teeth divided by the pinion teeth=rear ratio. Is the 8.8 a limited slip, I thought that was what you were looking for. Yes the 8.8 is a Limited slip unit. 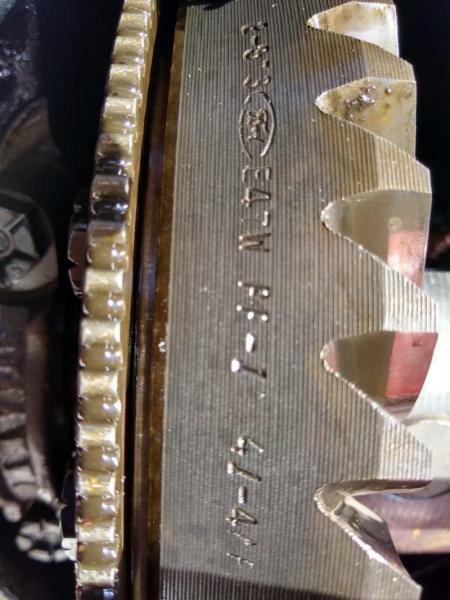 Doesn't ford put the number of teeth on the ring gear like most vehicles? Like 41-11 for 3.73? I suspect the 41? in the pic is part of that. Ford didn't offer a 41-10 (4.10 ratio). Well I heard that they did I read that it was the two numbers after the letters and the next two letters. Which would be the 41. You can divide the ring gear number of teeth by the pinion number of teeth to be sure. Apparently he doesn't want to do that...post 14. Passenger side axle tube, facing forward, about 6" inboard of the pumpkin. Use a wire wheel or brush to make it readable. You will get the axle code from what was in it when it left the factory.